Walking down the street in Seminyak. 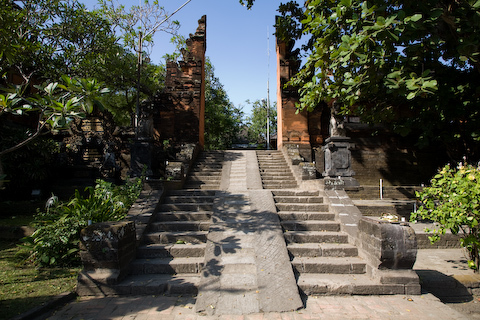 Ramp leading up to small temple in Seminyak. This temple is near La Luciola. Friends: Oh Bali, we love it there. Where do you stay? Us: We always stay in Seminyak. 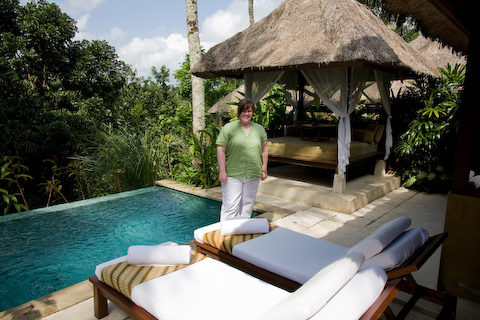 Friends: Have you ever been to Ubud? Us: No, maybe we’ll stay there next time. The truth is, we never change our plans and always end up at the same hotel in the same small town, until this time. We decided to give Ubud a try and we’re glad we did. 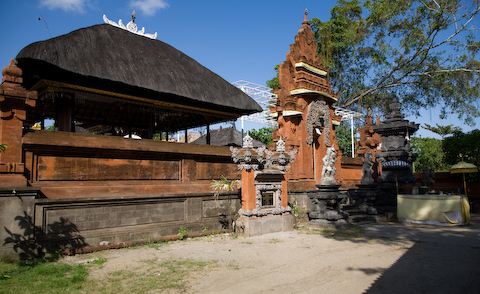 Ubud’s been described as Seminyak in the mountains. From what we’ve seen so far the description is fitting. It’s a small town made up of cafes, restaurants and boutique shops. Ubud is made for strolling with occasional stops for hour-long foot massages for $5. 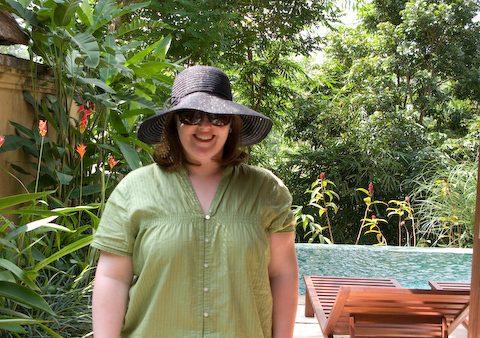 Laura checking out our new place in Ubud. We are staying about 15 minutes out of town in a beautiful, small hotel called Komaneka at Tanggayuda. 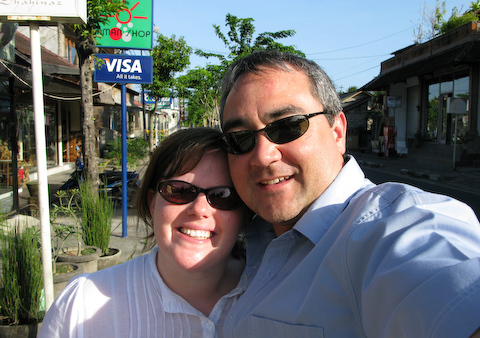 They have another hotel in Ubud, but this one was recommended by our good friend. 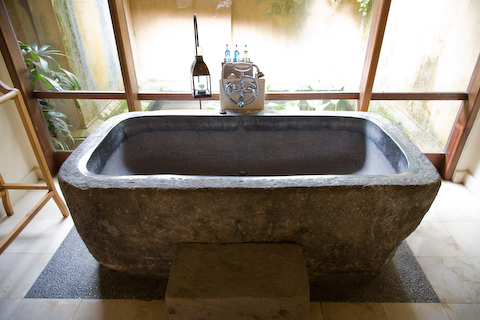 This bathtub is very impressive to see in person; they must have built the villa up around it, because it’s been carved out of a single piece of stone. There’s a fish pound with some friendly frogs on the other side of the window. 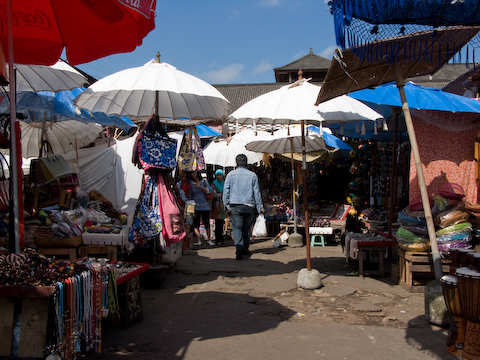 This market off the main road is where you can find just about any kind of Balinese craft or souvenir to take home. Enjoying a little shade and some chicken satay with peanut sauce. Delicious! Hey Erika, this photo’s for you. Laura wanted you to know that the black hat and sunglasses made it. 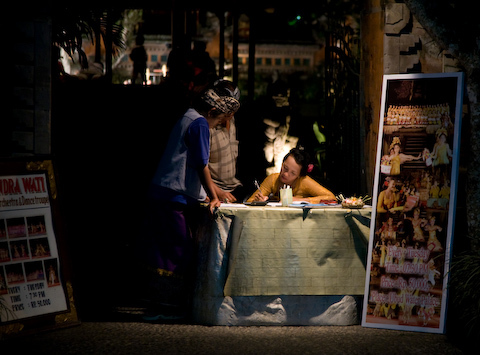 Selling tickets to a traditional Balinese performance. I think I want to move into that hotel. So, which one you prefer. Seminyak or ubud??? Although I’d be perfectly happy in either place, Seminyak is the spot we return to time after time. The beach element adds something very soothing to the environment.